Have you seen the Russian version of The Hobbit? 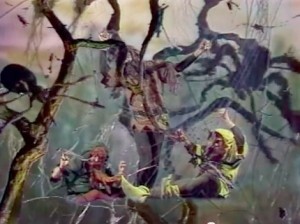 This Russian version of The Hobbit, made in 1985, is nothing less than fascinating. You may have a hard time following it unless you understand Russian, as there are no captions, but it’s nevertheless always intriguing to see how someone else visualises Middle-earth. Some background via the Youtube comments: Technically this is not a movie. It’s a theatrical performance filmed﻿ on a TV studio. That’s what “телеспектакль” stands for. Think of it as of a TV show for little children. These were pretty popular at the time, because soviet televison didn’t have anything you could call a “show” in modern sense. Also, the narrator here is Zinovy Gerdt — one of the most famous and recognised soviet actors. There’s also a sub-titled MST-3K style parody (bad language warning!) here.